Making of a Mage? Nay, making of a Sorcerer. As I promised in the first part of the journal, I'll spill some secrets about how playing a Sorcerer looks and feels like. 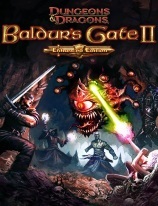 As you probably know already, the Sorcerer class is one of the three new 3rd Edition Dungeons & Dragons classes that were added to Baldur's Gate II. (The other two are the Monk and Barbarian). The main difference between your regular mage and a sorcerer is in their spellcasting ability. Mages have to pick and memorize the spells before they can cast them, where sorcerers get a fixed amount of spells they can cast per day. The catch is, all of the sorcerer's spells are one level below what a regular mage could cast with the same amount of experience/level. Sorcerers should also be able to wear armor and cast spells while doing so, but with a hefty chance that the spell will fail. Another interesting point is that the number of spells that they are able to cast is determined by the Charisma attribute. That is how it's SUPPOSED to be in the 3rd Edition D&D. However, due to the fact that BGII is not a 3rd Edition game, the actual implementation of this class in BGII was adjusted to to fit the current 2nd Edition rules and engine the game is using. So alas, you aren't able to wear armor and you use the Intelligence attribute to determine how many spells will be granted to you. Also, you cannot learn spells from scrolls, so the only thing a Sorcerer can do with a scroll is to cast it directly. Memorizing is still the same as with a regular mage - your spells get rememorized every time you sleep. You get 5 level 1 spells, 3 level 2 spells and 2 level 3 spells to start with (with 18 INT) at the character generation screen. It seems that you get an additional spell or two every time you level up in the game from there on. You can choose the spell(s) you want. All the spells are in the spellbook at the same time, and all are memorized at the same time. But as you cast one (doesn't matter which), the number of all spells of that level that you can cast goes down by one. So, let's say you have a Magic Missile, Chromatic Orb, Grease, Blindness and Larloch's Minor Drain as 1st level spells. When you rest you memorize all of them, and you can cast any 5 from that level. So, 5 drains -or- 5 missiles -or- 5 chrome orbs etc. Or 1 orb, 1 missile, 1 drain, 1 grease and 1 blindness. The system remains the same with higher level spells too. A good example of a wrong decision is picking up the Find Familiar spell for a Sorcerer. It will take a valuable slot in your spellbook, but you will use it only once, because if your familiar dies you lose one 1 CON point permanently. Buy spells like that and cast them from scrolls instead. Part III of this journal will contain my general impressions of the game thus far and screenshots of a major magic battle you could call a spoiler but since I've been holding back on them till now, I can be excused for that. Coming soon.